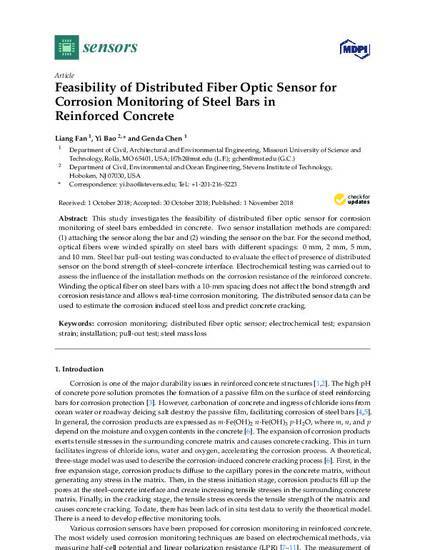 This study investigates the feasibility of distributed fiber optic sensor for corrosion monitoring of steel bars embedded in concrete. Two sensor installation methods are compared: (1) attaching the sensor along the bar and (2) winding the sensor on the bar. For the second method, optical fibers were winded spirally on steel bars with different spacings: 0 mm, 2 mm, 5 mm, and 10 mm. Steel bar pull-out testing was conducted to evaluate the effect of presence of distributed sensor on the bond strength of steel—concrete interface. Electrochemical testing was carried out to assess the influence of the installation methods on the corrosion resistance of the reinforced concrete. Winding the optical fiber on steel bars with a 10-mm spacing does not affect the bond strength and corrosion resistance and allows real-time corrosion monitoring. The distributed sensor data can be used to estimate the corrosion induced steel loss and predict concrete cracking. Financial support to complete this study was provided in part by the U.S. National Science Foundation [grant No. CMMI-1235202], the U.S. Department of Transportation [grant No. DTPH5615HCAP10], and Stevens Institute of Technology.